Blog posts are simple, consistent, and cost-effective. As a plumbing company, you might not have the time or resources to adhere to a monthly post schedule. Lack of consistency negates the positive impact of blogging and renders its effect useless. Plumbing Webmasters offers different types of content management plans so that contractors never have to worry about blog schedules. 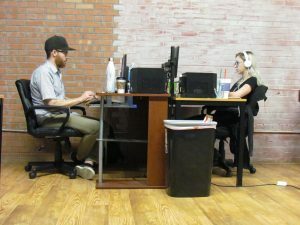 Our on-staff content team crafts individual posts, specifically for your website. We use WordPress for content management which allows us to publish blogs internally on your website. This prompts Google to crawl and index your primary domain more frequently. Call Plumbing Webmasters at (877) 388-9884 to further discuss how blogging improves your online presence in 2019. Publishing a post is important, but the action in of itself is not enough to make an impact. For a post to contribute SEO, lead generation, and brand development, it must possess certain distinct qualities. 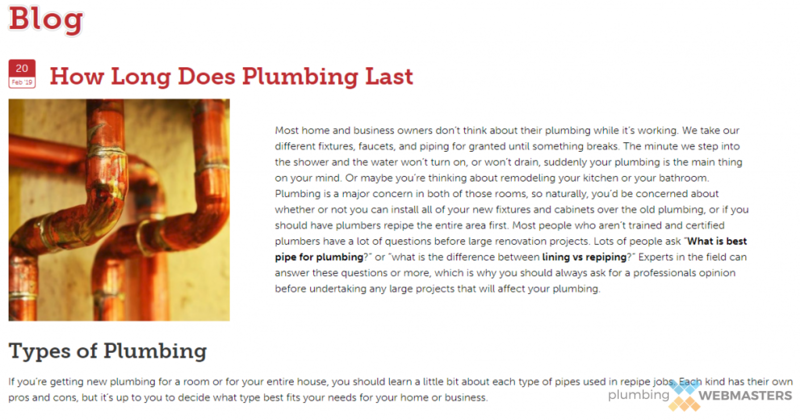 Plumbing Webmasters’ content team optimizes each post meticulously to maximize its influence. Competitor websites are targeting identical goals, so separation through exhausted details is often the difference between success and failure. The bare minimum (i.e. publishing a post) is not enough to solidify your content as authoritative to Google. To truly separate your content from competitors, blog posts must be. Plumbing Webmasters’ usage of WordPress content management system, fosters blog posts with inherently greater SEO potential. Generally speaking, there are two types of blogs; internal and external. WordPress supports internal blogging, which publishes posts natively on your primary website domain. This also allows for responsive and mobile formatting options which can make your blog easier to view across multiple devices. External blogs, in contrast, are published on 3rd party servers, most commonly; Blogger, and WordPress.com (not to be confused with WordPress, the CMS). Posts are dynamic because of their informality, allowing plumbing companies to communicate with customers in ways not otherwise possible. Topics can incorporate everything from modern plumbing trends to employee profiles. How Often Should Plumbers Blog? Your website should receive a new blog post at least once per month, ideally. Plumbing Webmasters creates regular blogs for your site on a monthly basis. This schedule keeps fresh content circulating on your website, encouraging Google to crawl and index new posts. In addition to increasing search visibility, monthly blogging creates an additional conversion funnel in which consumers are attracted and converted. 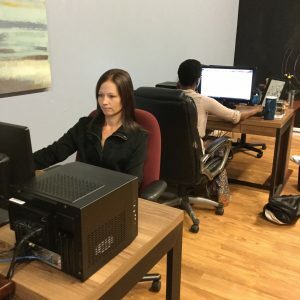 Plumbing Webmasters’ SEO experts perform comprehensive keyword research to identify opportunities for post topics relating to the plumbing industry. Mobile Blogging for Plumbers Means Compressed Images and Stylized TextBoxes to Create a Quality Search Experience. Blogging helps brand your plumbing company and adds to your ongoing SEO efforts. Publishing posts with a distinct voice, style, formatting, and visual engagement, exposes your company’s identity to a large consumer base. Enriching content with infographics, videos, and other rich media options engages readers more effectively for better conversion rates and marketing ROI. Attention spans have grown shorter, making engagement more critical for content marketers. Voice and style can range from serious to informal, and which direction we go depends on direct consultation with our clients. Your input is valued in developing brand identity. Call Plumbing Webmasters at (877) 388-9884 to learn more about how blogging generates high quality leads for plumbers like you. Updated on April 9, 2019 at 8:46 pm by Plumbing Webmasters.